Whether you are an experienced entrepreneur or starting a new Notary business, it’s wise to review your insurance coverage to make sure all your liability bases are covered. A Notary errors and omissions insurance (E&O) policy protects a Notary from liability due to unintentional mistakes during a notarization. But a single insurance policy doesn’t usually cover every workplace need for self-employed Notary entrepreneurs, said David Howell, a Texas Notary, business owner and mentor with SCORE, a national nonprofit association that helps small businesses get off the ground. 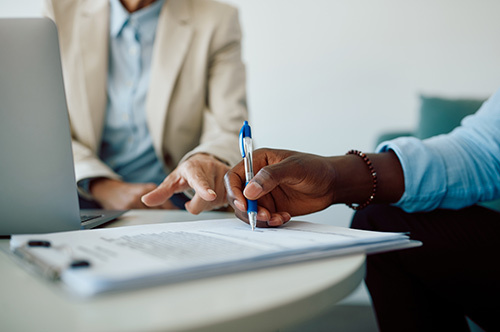 While an E&O insurance policy covers notarial liability issues, a small business owner has to be prepared for other possible liability concerns E&O doesn’t cover, Howell said — especially if your Notary work requires you to visit a signer’s home. For example, a Notary might be injured in a mishap while out on the job, or a signer might find an item missing after a notarization and blame the Notary who just visited for a document signing — situations that wouldn’t be covered by an E&O insurance policy. As a result, Howell recommends that self-employed Notaries review their small business insurance to be sure they have adequate coverage for potential liability and damages from non-Notary as well as notarial issues. “Depending on what type of Notary work you do, you may need a general business owner’s insurance policy in addition to a separate policy relating to specific issues like E&O,” Howell said. He also suggested Notary entrepreneurs with questions about their coverage should consult with an insurance agent familiar with both general business liability and the specific issues Notaries face — such as lawsuits for notarization errors or someone else forging the Notary’s seal or name on a fraudulent document.